Yesterday the Nasdaq Composite (^IXIC) fell below three long-term support levels. Unlike the Nasdaq, the S&P 500 (^GSPC) stayed above important support. 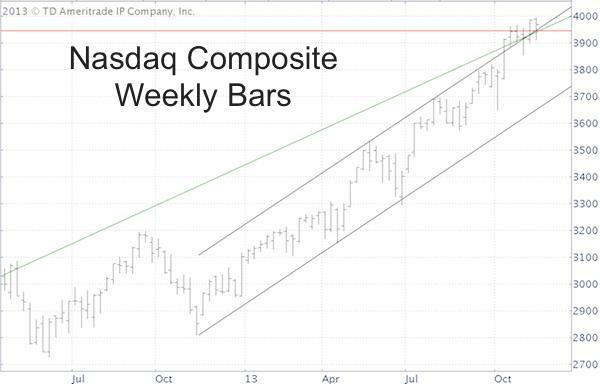 The Nasdaq Composite chart shows an obvious support/resistance cluster right around 4,000. The Nasdaq is back above 4,000, but the problem is there there’s no real obvious target. How high can the Nasdaq and the Nasdaq QQQ ETF (QQQ) fly? I always monitor the three main U.S. indexes, S&P 500, Dow Jones and Nasdaq (Nasdaq Composite and Nasdaq-100). Every Index provides a different ‘piece of the puzzle’ in terms of the market’s whereabouts. Right now, the S&P 500 offers short-term must hold support, and the Dow Jones pinpoints an obvious and solid target based on long-term chart analysis. Stocks will probably run into some trouble once the S&P 500 support breaks or the Dow Jones target is reached. My guess is that it will be the Dow Jones target/resistance level that will break this ‘camel’s back’ … temporarily. Regular market forecast updates (at least twice a week) and corresponding trade recommendations are provided via the Profit Radar Report. Simon Maierhofer is the publisher of the Profit Radar Report.